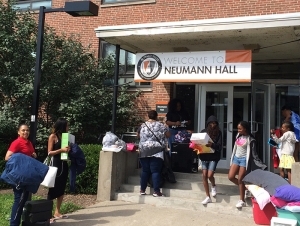 With almost 2,800 students moving into their campus residences, it’s a busy week for both students and Residence Life staff at Buffalo State. Thursday, August 24, was the day when new students—both first-year and new transfers—set up the space where they will live this academic year. "We are delighted to welcome our new students," said Buffalo State President Katherine Conway-Turner. “Our Residence Hall staff is eager to help students make the transition to college life, and they will be on hand to answer any and all questions new or returning students may have." Many successful students and alumni emphasize that getting involved in campus activities was key to their academic, educational, and career accomplishments. Those activities include undergraduate research opportunities, academic and personal support, national and international study opportunities, service learning, and the many organizations sponsored by United Students Government. "We pride ourselves on our engagement with the community," said Conway-Turner. "I hope all our students join us on 'Bengals Dare to Care' day on September 16." Today, though, the excitement of starting college eclipses everything else. Joel Okine from Mount Vernon, New York, spoke for many students when he said, “I feel like I’m ready to succeed.” He plans to become a mechanical engineer. Mohammed Siddique, too, is looking forward to being successful as an entrepreneur. Monday, August 28, marks more than just the beginning of classes. For these first-time, first-year students, Monday is the first step on the path to creating their adult lives.